It runs from left to right, top to bottom. Kip is believed to be the runner in the lower left hand shot with his bib completely covered up, next to Ms. 2573. In the previous shot, Ms. 2573 can be seen coming in the distance, and you would think that you would see a piece of Kip's left side. But instead, he just pops into the one picture hugging closely to the side of the road like he just jumped back in. I wonder if the changing of caps along with his history could potentially be enough for the BAA to DQ him? Look at the guy behind 2076 in the photo before Litton's. He's blocked by 2076 but looks like his head is turned as if something has caught his eye, like Kip jumping in maybe. Let's just step back for a minute. One of the possibilities remaining is that he had an accomplice in all this. Indeed, some people think they see two different men dressed alike. Why would someone help Kip? What is in it for them? The only way someone would help (if that is the case) is if there is something in it for them. Vanity could lead someone to pay a helper from their own money, but man, you have a guy cutting courses, you have fake marathons, and you have someone running for charity... it starts to smell real bad. A wise man might come forward no and put an end to it before it gets worse. The watch is what I noticed too. It appears to be the same watch. It's hard to tell if the glasses have the same orange tint because the head is dipped. I noticed that the split times are pretty even ~20 mins each, but the split between 20k and 25k is a couple of minutes longer. This is where you pass by the screaming Wellesley wall. Is it possible the difficulty getting on and off the course through here took longer than expected? Like all of you, I am puzzled as to how he is able to cut the course in certain races. Everyone has come up with interesting theories. There was a tv show that had a plotline in which a murder suspect used a marathon race as his alibi. (He actually did commit the murder, but fooled people for awhile by placing his chip on a golf cart or something that crossed every timing mat.) I think it aired about 10 yrs ago. Anyway, I'm not saying proposing that this was his method, but it's interesting nonetheless. One thing about these pix that no one pointed out - - look at the other runners - they are "second wavers" - their numbers are all in the 2000s. How does one run 2:52 while running with the second wavers at what is probably 7:30 pace. 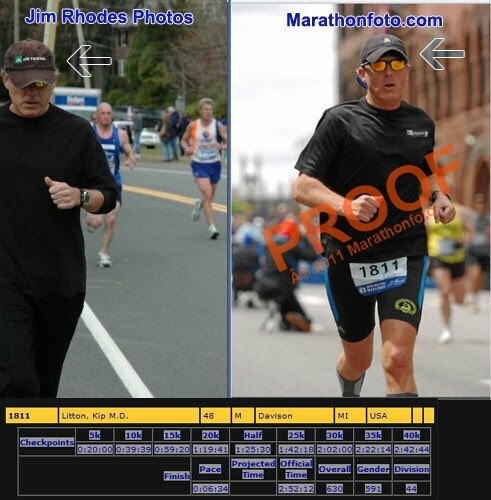 Very few of those other runners look fast, many look >50 yrs old. Where again in the race was this taken??? People look someone spaced out even for that pace, thus possibly later in the race. Hiss splits were allegedly mid 6's the whole way. his bro Kurt ran Boston? Why would you have to take off your hat? To put on your bike helmet. I number in the 2000s is not second wave at Boston. Those numbers around him are about right for a 2:52. No, I found it on his work website. They look awfully alike - same glasses I bet, similar caps. A costume change basically. Why is the KL found in Rhodes photo dressed like it's 20 degrees out. Most everyone else is in shorts and tanks. He is also at the extreme edge of the road - easy on, easy off. btw, Monk would have figured this all out already. All these people are legit and probably faster than you. What you're saying doesn't make any sense. Check their bib #s, genius.